It can sometimes be difficult for students to write exactly why they covet something highly desirable and popular, aside from the usual reason of peer pressure. 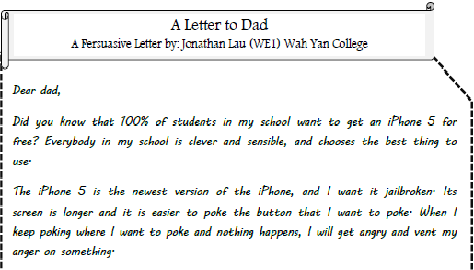 In this persuasive letter to his father, Jonathan gives specific details to back up his reasons for wanting such an item. The consequences of not having it are written with flair and personality. In the module Descriptive Writing, our WF2 students learned several techniques they could use to give life to their descriptions. Laetitia not only did that, but also added a wealth of anecdotes and picked the most special thoughts and feelings to write about. The depth of the piece is a huge improvement, and makes it a very personalized piece indeed. During term 2, students learnt about fictional writing and were taught how to plan a story with the use of a story roller coaster. This method is useful for the students at this level as it encouraged better organization of ideas by pushing students to think through each section of the story in more detail. As a result, the finished product turns out to be more coherent and logical. Students were taught how to write with clear nouns and precise adjectives, avoiding the use vague words such as “something” or “stuff”. It is apparent from Davis’ finished piece that he applied these newly acquired techniques very well. He wrote with precision and demonstrated his creativity through his choice of words and story content, creating vivid mental images for most of his scenes. 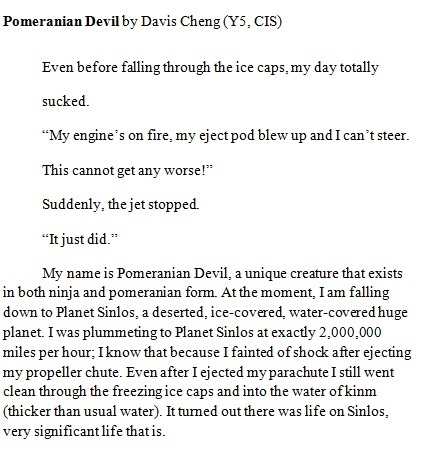 Take a look at his exciting tale, "Pomeranian Devil", by clicking the PDF link below! Reading Comprehension: Students read a large variety of texts that described everything from windows and bathrooms, to magical new worlds. Comprehension questions challenged students to apply their imaginations and inference skills. Ashley has always impressed with her great work ethic and practicality, but we were so pleased to witness her imagination really came through during the descriptive wriitng unit. 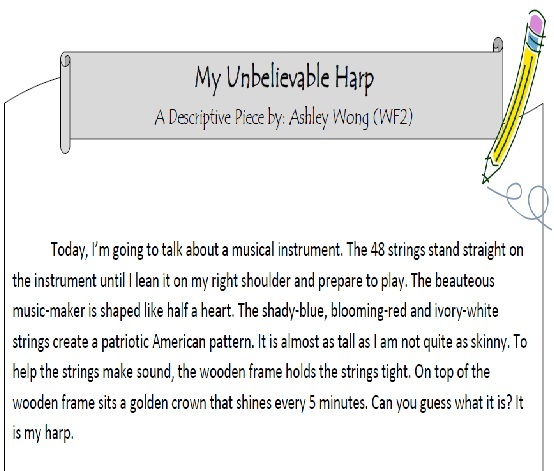 Check out her wonderfully colorful descriptive piece in which she describes her beloved harp by clicking the PDF link below! Fiction story planning: brainstorming concepts, selecting a specific and descriptive time and place (setting), creating a main character and identifying their descriptive characteristics, mapping key events in a fiction story with an emphasis placed on writing in the past tense – the problem, the solution, the conclusion. Hannah is a returning student from our summer writing program. She has made such immense improvement since she first started attending classes at The Open Classroom, we couldn't resist sharing her latest creation! 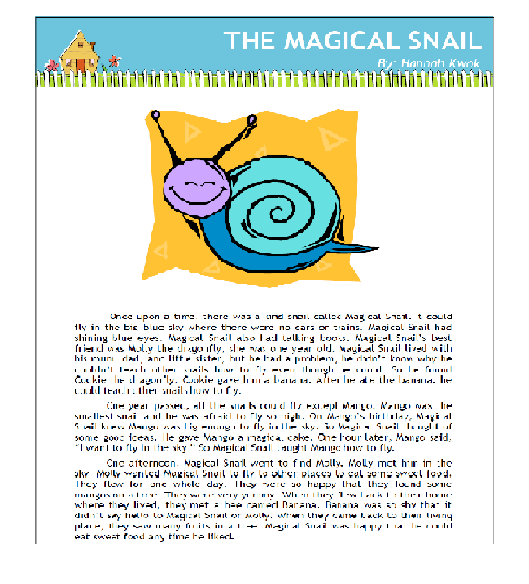 Click the PDF link below to check out Hannah's magical fiction-tale! 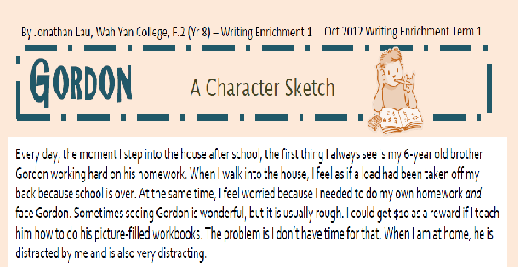 Our Writing Enrichment 1 students all worked hard during the first part of Regular Term 1 2012, but here is one particularly noteworthy character sketch by Jonathan! Writing technique: Effective dialogues and action words; Importance of character development through introduction of the protagonist, numerous suspects, and development of plot through clues, climax and resolution. 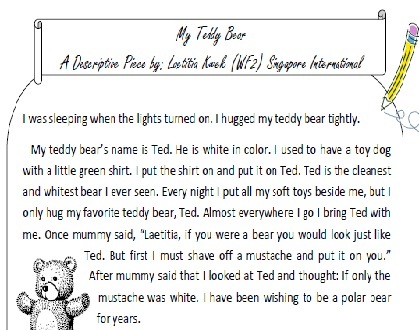 Vocabulary and Comprehension skills: Students read extracts from other detective stories and mysteries and analyzed how the authors wrote with purposeful dialogues, used strong verbs and descriptive words, and built suspense. 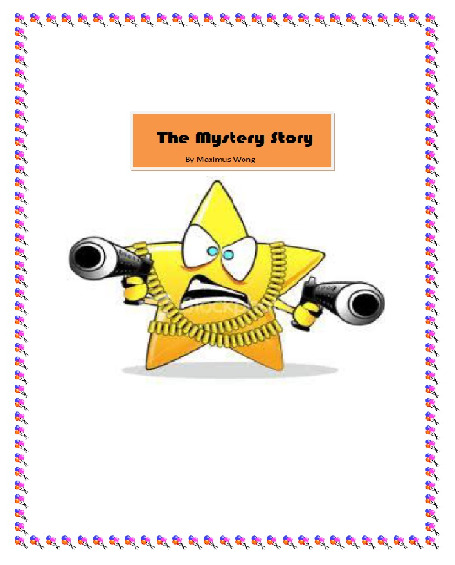 Check out one stellar writer's final detective story output below! The students recounted a memorable day from their past experiences in journal form. 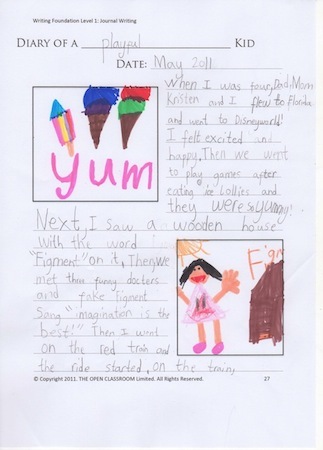 Take a look at Jamie's illustrated tale about her trip to Disneyworld and the acquisition of her new imaginary friend!